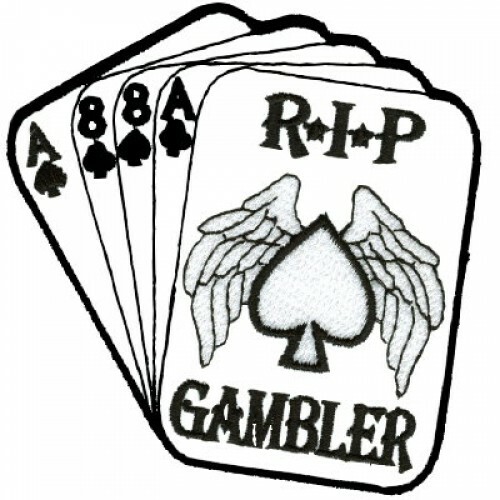 This is a custom designed memory patch that has the infamous "DEADMAN'S Hand" of Aces and 8's. It is about 3.5" wide and tall. THE MINIMUM QTY TO ORDER IS 4. Your choices include the background color - obvious. Then you choose the border color, it will include the color of the edge of the cards and the outside of the patch. 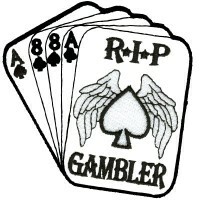 The lettering color will include the color for the Aces & 8's on the cards as well as the RIP and ROADNAME on the bottom. You can also have your choice of color for the wings and wing border, large ace and ace border.